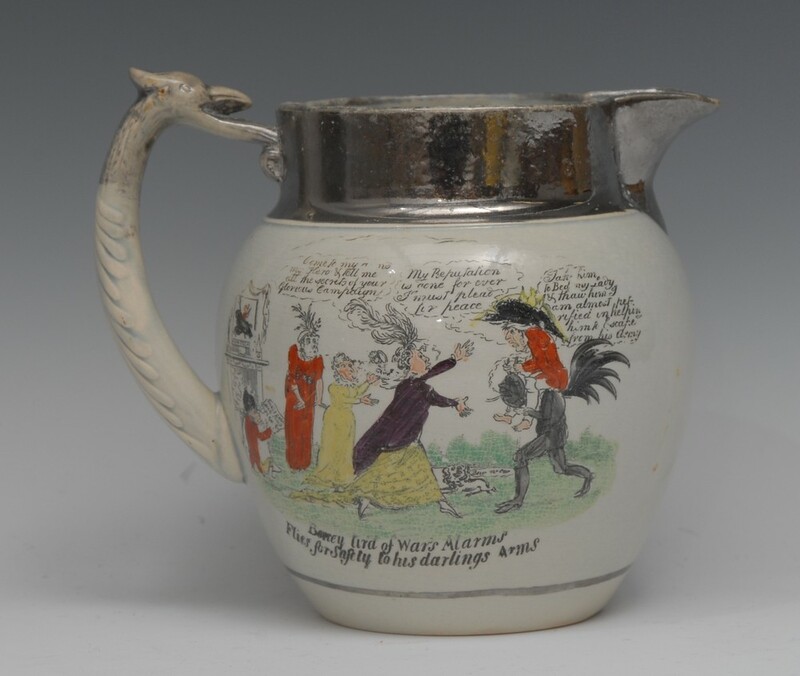 This rather bling pearlware silver lustre jug has been decorated with a transfer copy of George Cruikshank’s Boney tir’d of War’s Alarms, Flies for Safety to his darlings Arms, which was originally published by Knight & Walker of Sweetings Ally, Royal Exchange, in January 1813. As always with caricature-related pottery, it’s interesting to see how the potter has modified the design in order to compensate for the dimensions of the vessel. In this case two of the characters – the infant King of Rome and his nursemaid – have been removed and the text has been shortened to ensure that the whole design fits onto one side of the pot. The colouring has been applied in a rather slapdash and heavy-handed fashion which virtually obliterates the details of the design in some places. Most unusual of all is the use of green wash to denote the floor and background, which creates the impression that this is an exterior scene despite the rather obvious presence of the fire and chimney breast on the left. However the colour-scheme is broadly similar to the printed version and this suggests that the painter had either seen Cruikshank’s original or was at least working to instructions drawn up by somebody who had. The image is one of a large number of caricatures on the subject of Napoleon’s retreat from Moscow which were published in England during 1813. The Devil is shown carrying the bedraggled Emperor back to Paris on his shoulders to be greeted by the hysterical Empress Maria Louise and her retinue. A monkey dressed in French military uniform and a red Jacobin bonnet sits by the fire reading a list of the revolting things that were eaten by starving soldiers as they marched back across Russia. Above him hangs a picture of a Cossack cavalryman symbolising the Russian army. As this print wasn’t published until 1871, I feel like a bit of a cheat posting an image of it on a blog that usually concerns itself with the history of visual satire in the Georgian period. 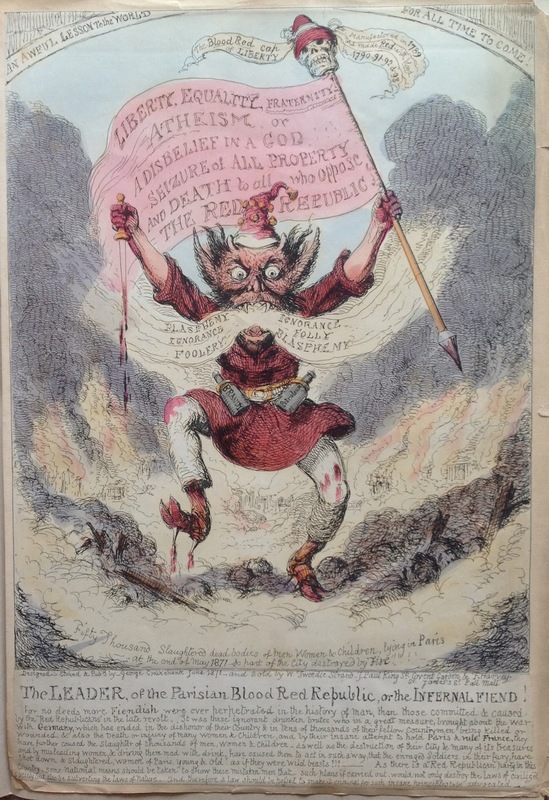 However in this case I think we can make an exception, not only because it was one of the last prints produced by the eminent Georgian caricaturist and illustrator George Cruikshank, but also because the image itself is so obviously a deliberate attempt to evoke the spirit and style the so-called ‘golden age of British caricature’. And besides, it’s such a fantastic-looking print that I couldn’t resist taking the opportunity to prattle on about it. Fifty thousand slaughtered dead bodies of men women & children lying in Paris at the end of May 1871 and part of the city destroyed by fire!!! The Leader of the Parisian Blood Red Republic, or the Infernal Fiend! For no deeds more Fiendish were ever perpetrated in the history of man than those committed & caused by the “Red Republicans” in the late revolt. It was these ignorant drunken brutes who in a great measure brought about the war with Germany, which has ended in the dishonor of their country & in tens of thousands of their fellow countrymen being killed or wounded & also the death and infamy of many women & chidren, and by their insane attempt to Paris & rule France, they have further caused the slaughter of thousands of men, women & children, as well as the destruction of their city & many of its treasures and by misleading women & driving them with drink, have caused them to act in such a way that the enraged soldiers in their fury have shot down & slaughtered women of Paris, young & old as if they were wild beasts!! !____ As there is a “Red Republican” party in this country, some national means should be taken to show these mistaken men that such plans if carried out would not only destroy the laws of civilized society but also by subverting the laws of nature and therefore a law should be passed to make it criminal for such insane principles to be advocated. The real target of Cruikshank’s satire was therefore not the Communards themselves, most of whom were either in jail or quitely decomposing in the grounds of Pere Lachaise Cemetary by the time the artist sat down to engrave this image, but British socialists who sought to bring about similarly radical political, social and economic reforms at home. In April 1871 representatives of Britain’s bourgeois press had watched with disgust as a crowd of several thousand workers paraded through London waving red banners carrying slogans such as “Vive La Commune” and “Long Live the Universal Republic”. The march then converged on Hyde Park where, after listening to speeches and singing several renditions of the Marsailles, the crowd loudly endorsed the reading of a public addresses which hailed the Commune as “a ressurection of the glorious era of the First French Republic”. The Telegraph, ever the tiresomely shrill voice of middle England, thundered that the Communards were little more than “assassins” and “convicts”, while the Daily News confidently asserted that “even the most humane” of its readers “would not be too scrupulous about the repressive measures which might be necessary” to ensure such sentiments were stamped out at home. Commentators on the political right were just as keen to reach back and appropriate rhetoric and imagery associated with the French Revolution as those on the left. Hostile press articles at the time were littered with references to Robespierre, the Terror and the Napoleonic Wars, as conservative news agencies sought to remind misguided members of the working classes of the speed with which the idealism of 1789 had been swept away by atrocity and war. This image was evidently intended to hark back to the era of the French Revolution and remind the contemporary generation of Britons of the dangers which their fathers and grandfathers had fought to destroy. 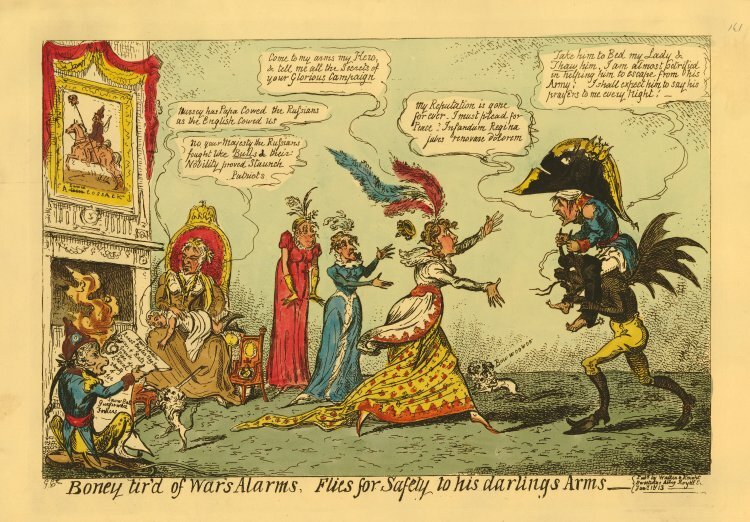 The fact it was produced by Cruikshank, who was by then the only living artist with a direct connection to the caricatures of that period, was no doubt calculated to increase both the satirical impact of the print and to boost its commercial appeal. This advertisement appeared on front page of the The Essex Standard, and Colchester and County Advertiser on Saturday 23rd November 1833. 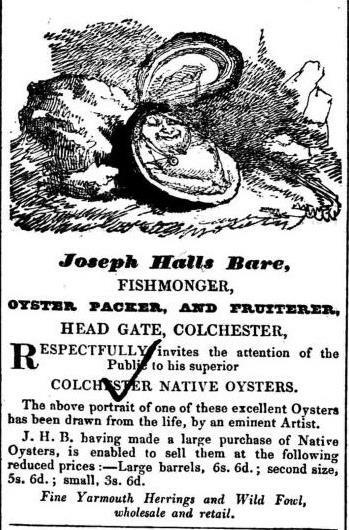 The “eminent artist” responsible for producing the drawing was George Cruikshank and contrary to the advertisement’s assertion, it was not produced for the express purpose of illustrating the merits of Joseph Halls Bare’s “superior” Colchester oysters. Cruikshank had in fact created this image three years earlier to be used it as one of the illustrations in William Clarke’s humorous miscellany Three Courses and a Dessert. A copy of the original woodblock engraving can be found in the British Museum online catalogue. 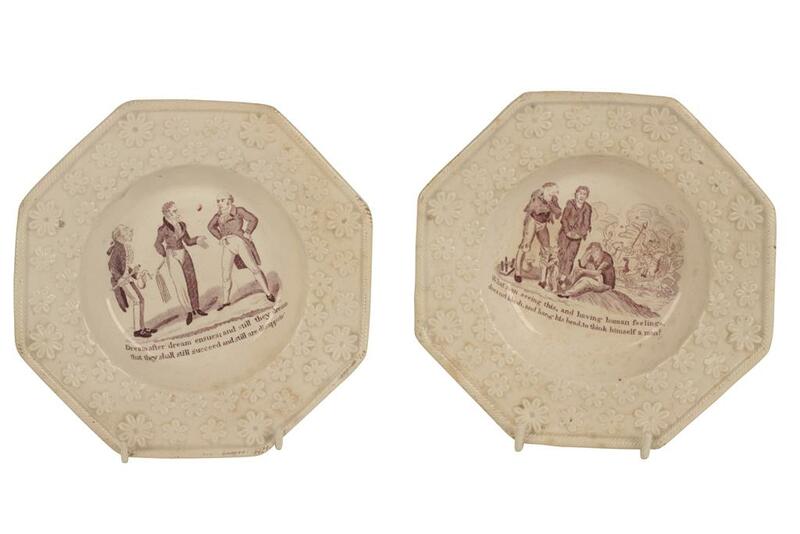 Cruikshank had maintained a link with the world of advertising since the earliest days of his career, producing small engravings to illustrate lottery puffs and other items during the 1810s and 20s. Most of the work was published without his signature, presumably to avoid cheapening the carefully cultivated Cruikshank brand by associating it with the grubby business of the jobbing engraver. However he was never to proud to turn down a paycheck and presumably insured that his name was not directly associated with the images he produced for explicitly commercial purposes. 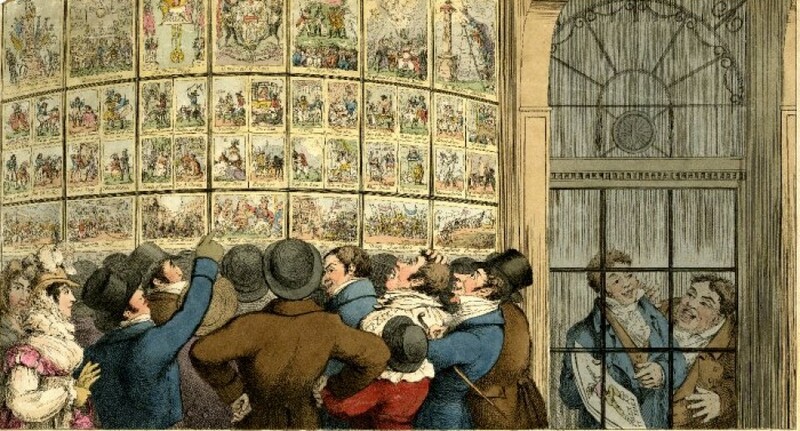 This was of course nonsense, as all his images were engraved for some commercial purpose or other, but there was a distinct difference in the perceived merits of an artist who engraved images for sale in their own right and one who dealt in advertisements, trade cards and other ephemera. One suspects that the use of the anonymous title “an eminent artist” in the advertisement above was a condition that Cruikshank himself may have insisted upon. The advertisement also indicates the extent to which caricature itself had become commercially devalued by the early 1830s. Greater use of woodblock engraving and the introduction of lithography had made images cheaper to produce and more affordable. They also allowed for much more creative integration between pictures and printed letterpress text. 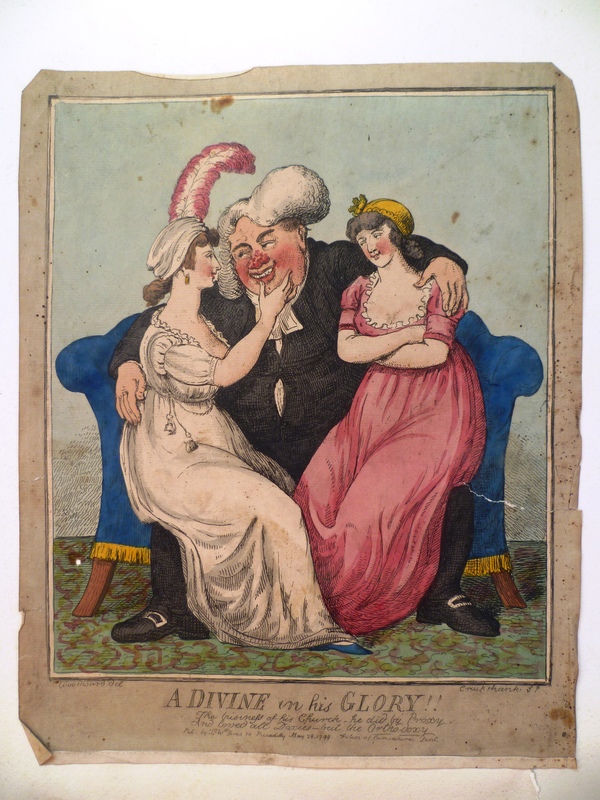 The fact that this caricature appeared in an advertisement of a small provincial newspaper indicates the degree to which the market for such images had changed since the days of Gillray and Rowlandson.